The new Galaxy S III may be cool and all, but I'm sure we all remember the enormous amount of time it took to introduce the Galaxy S II in the US. Samsung's new sign-up site for information hints at a relatively soon release of its new flagship in the US. In order to complete the sign-up process, you have to enter your zip code. The only reasonable explanation for that is that Samsung has already lined up with the carriers which should result in a quick release. Let's hope so. 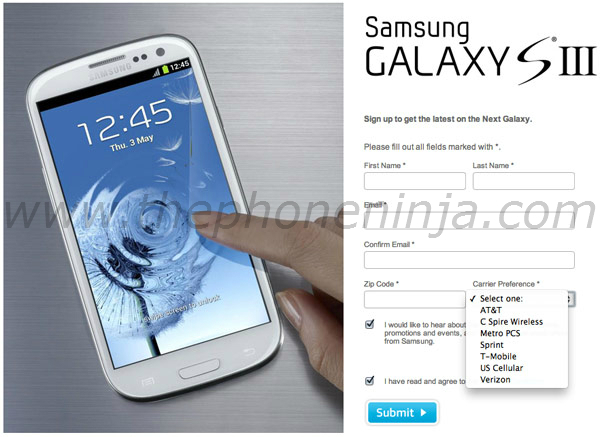 Update: The "carrier preference" section has since been removed from the Samsung Galaxy S III sign up page.